Size--Caliber: 10CM(3.94 inches); Bottom Diameter: 8CM(3.15 inches) ; High: 10CM(3.94 inches) . Material:made of Durable Metal Iron. 10 different Colors as the picture shows. Perfect for your deck,balcony,patio,front porch,or inside your home. Can be used with Dried flowers,Silk flowers,decorative pots outside,Potted plants ,Hanging on the balcony, window,Fence,railings, indoor and anywhere. ATTENTION: No Drainage Hole Design To Prevent Dirty Scence. Here's No Hole Needed For The Small Planters Either. Detachable Hook is very easy to use. Package Qty:10 Pcs 10 different Colors Flower Pots. 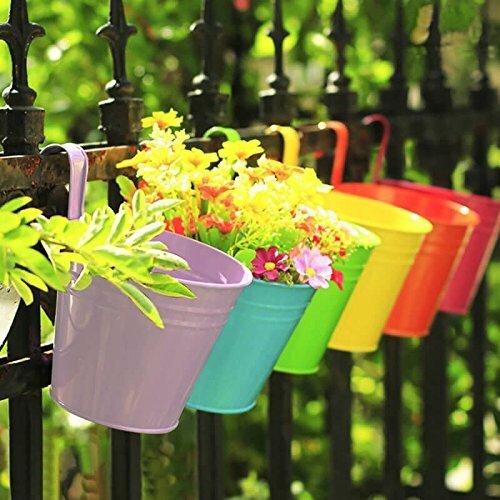 10 Different Colors,Flower Pots are made of Durable Metal Iron and ideal for Gardener. ❤ATTENTION: No Drainage Hole Design To Prevent Dirty Scence. Here's No Hole Needed For The Small Planters Either. Detachable Hook is very easy to use. Use Metal Iron Hanging Flower pots to Decorate your home and garden and hold colorful flowers,tasty herbs,peppers,succulent strawberries,plump tomatoes. If you have any questions about this product by KINGLAKE, contact us by completing and submitting the form below. If you are looking for a specif part number, please include it with your message.